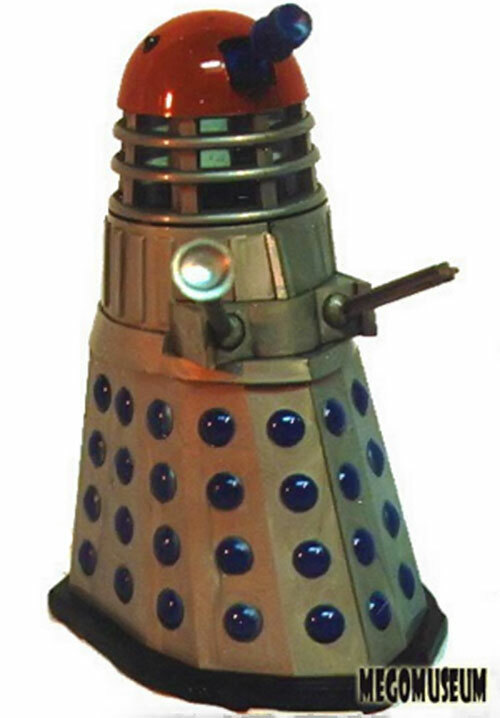 See also our Daleks (Modern) writeup. There are now two factions: ones lead by Davros (the Emperor), and the other Daleks. Now, the thing to remember with Daleks, and this is absolutely crucial to Dr. Who continuity, is that there is not any single “Dalek” characterisation for the “species.” This is due to the fact that Daleks are very capable of time travel, meddling with time travel, are basically manufactured cyborgs (sometimes by The Master) and have existed in various disparate incarnations in multitudinous geographic and chronological epochs. 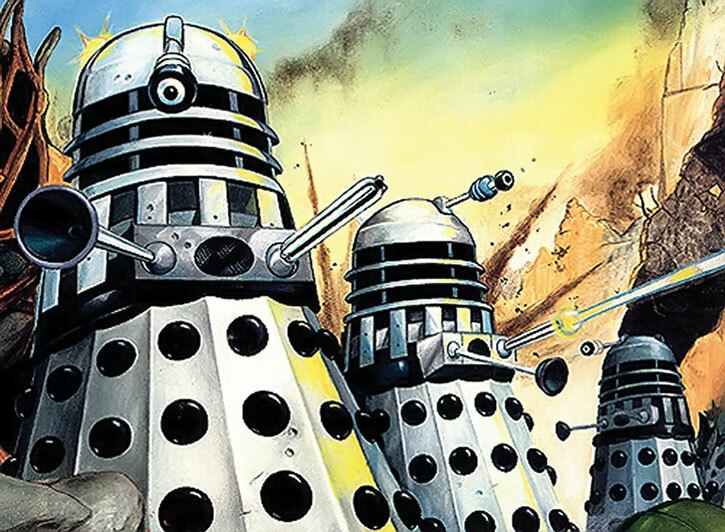 For example, the first “appearance” of the Daleks, I believe in the original Dr. Who series (the black and white one) had some relatively crude type Daleks invading England. 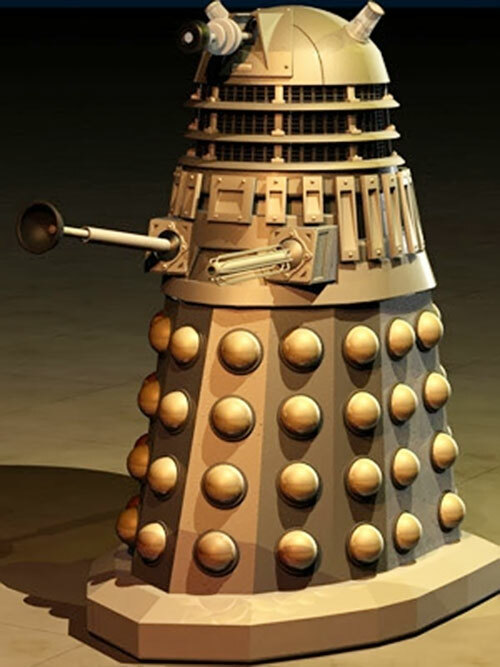 These Daleks are essentially indestructible by any known human means; weapons designers of the human rebellion try and fail to develop anti-Dalek bombs… The Daleks can’t be stopped. However, “later” on in Dr. Who, Daleks can be foiled by throwing a beach towel in their general direction or by roping them off or all kinds of ridiculously pedestrian methods. What this shows, I think, is that Daleks are a very long lived menace with time/space travelling capabilities. 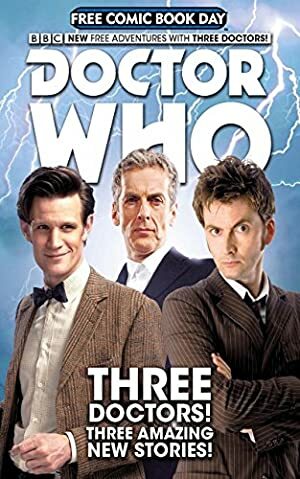 Hence, heroes can encounter earlier or later versions of the Daleks, with a little back story added (however fantastic) and every time the heroes encounter them, it can have a new twist to it. Replace the Kaleds with the the Psions. The Psions attempted to expand outside of the Sirius system and landed on Thal, getting into a war with the Thals already living there. The mad Psion scientist Davros used genetic experimentation on Psion casualties to produce the Daleks, who destroyed both the Thals and the Psions on that planet before expanding into their own galactic presence. This series of events led the Psions to abandon their future colonization plans and return to their self-imposed isolation. The Daleks are still an active galactic power in the thirtieth century. The LSH has repelled several attempts to conquer Earth, even travelling back in Earth history on some occasions to thwart them. Their plague was responsible for one of the Dark Ages mentioned in Earth history between the twentieth and thirtieth centuries. In recent years they have been distracted by the civil war that has arisen in their ranks.